This type of dish was a very popular export to India and the Middle East, as evidenced by the large numbers published in collections in Istanbul and Tehran, and the large number of copies made in earthenware. 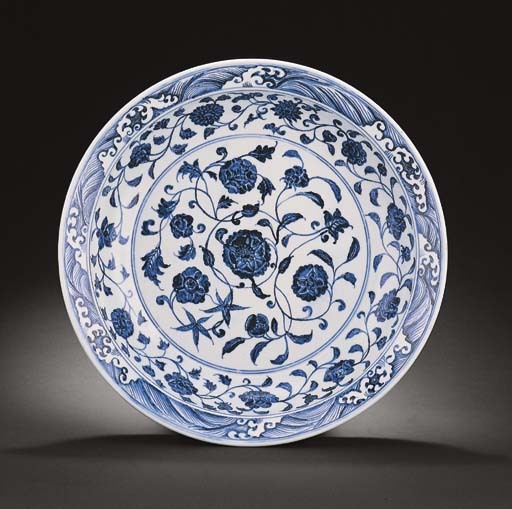 See R. Krahl, Chinese Ceramics in the Topkapi Saray Museum, Istanbul, vol. 2, London, 1986, pp. 512 and 514, nos. 601 and 606; J. A. Pope, Chinese Porcelain from the Ardebil Shrine, Washington, 1956, pl. 34, no. 29:88; and an article by P. Hardie, "China's Ceramic Trade with India", T.O.C.S., 1983-84, vol. 48, pp. 14-31, where the author illustrates a similar dish inscribed in Farsi around the foot rim with the name of the emperor, Shah Jahan, figs. 3 and 4. A dish of this type was excavated at Dongmentou, Zhushan, in 1994, and exhibited at the Chang Foundation, Taiwan, Imperial Hongwu and Yongle Porcelain Excavated at Jingdezhen, 1996, Catalogue no. 44. Other similar examples include one in the National Palace Museum, Taiwan, published in the Illustrated Catalogue of Ming Dynasty Porcelain, pl. 37; one exhibited at the Hong Kong Museum of Art, Ming and Ch'ing Porcelain from the Collection of the T. Y. Chao Family Foundation, 1978, and illustrated in the Catalogue, no. 5; one illustrated by J. Ayers, The Baur Collection, Geneva, 1969, vol. II, no. A140; and another included in the Philadelphia Museum of Art Exhibition of Chinese Blue and White, 1994, illustrated in the Catalogue, no. 38.